I am committed to breeding the highest Quality German Shepherds which includes health, temperament, intelligence, conformation and working ability. When you buy a puppy from me, you are getting a QUALITY German Shepherd to become a life time member for you and your family. All of my dogs are 100% German bloodlines, with good hips and elbows. Their German pedigrees consist of World Siegers, VA, V rated and Schutzhund titled,SCHH3, FH3 3x DDR SIEGER, EUROPAMEISTER German dogs. All of our dogs are AKC registered, and all of our puppies we sell are AKC registered. Our goal is to produce a beautiful dog with impeccable temperament and sound physical structure. The dog must have the spirit, courage and willingness to work in any area. Yet the dog must be entirely suitable as a loving family companion first and foremost. We strongly believe that a breeding should be carefully planned and done for the purpose of improving the finer qualities of the breed. I selected my dogs for breeding on the basis of their temperament, conformation and working ability. I carefully researched the bloodlines ensuring that breeding will produce only the finest quality puppies. My dogs are very well socialized and free to roam my farm. I do not kennel them and keep them locked up. I spend alot of time with our dogs and their puppies. 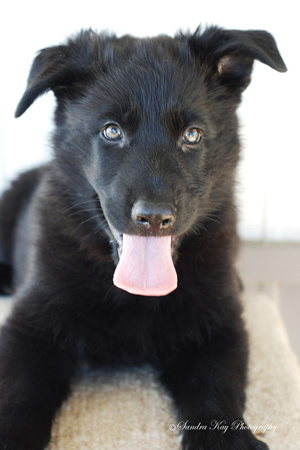 I cater to homes that want a puppy for their family, as devoted loving family companions. Our pups are extremely intelligent they can be trained to do whatever you want them to do. We specialize in Quality breeding, not quantity. One of my 9 week old males.